Ever have those days where you feel completely scattered and just can't get out the door, and every time you head out the door, you think of something else you're forgetting? 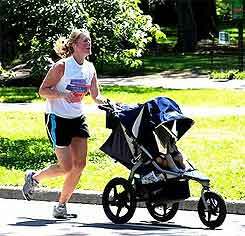 Well I would like to present to you, the runner mom checklist. Here is a list of all the things you should have with you if you are going for a run, whether solo or with your kid. I've left some empty slots at the bottom so you can add your own, then just print it out, and check it off as you prepare for your run. Oh and did you remember to put baby's shoes on? No insult to you, I just ask because I forgot once or twice. Thankfully I didn't get further than the elevator. There are many more things that a running mom may need, including a moment to herself from time to time. Visit this interactive checklist and share what one thing you believe a running mom can't live without.